I was in a MOODLE (mood for noodles), ok I invented a new word…haha! But seriously, I have never been successful at making a noodle stir fry because I always seem to mush up the noodles when it’s time to throw them in the wok. I think what saved me was the peanut sauce that allowed the noodles to mix well without burning and sticking to the bottom of the pan or maybe it was the sesame oil? 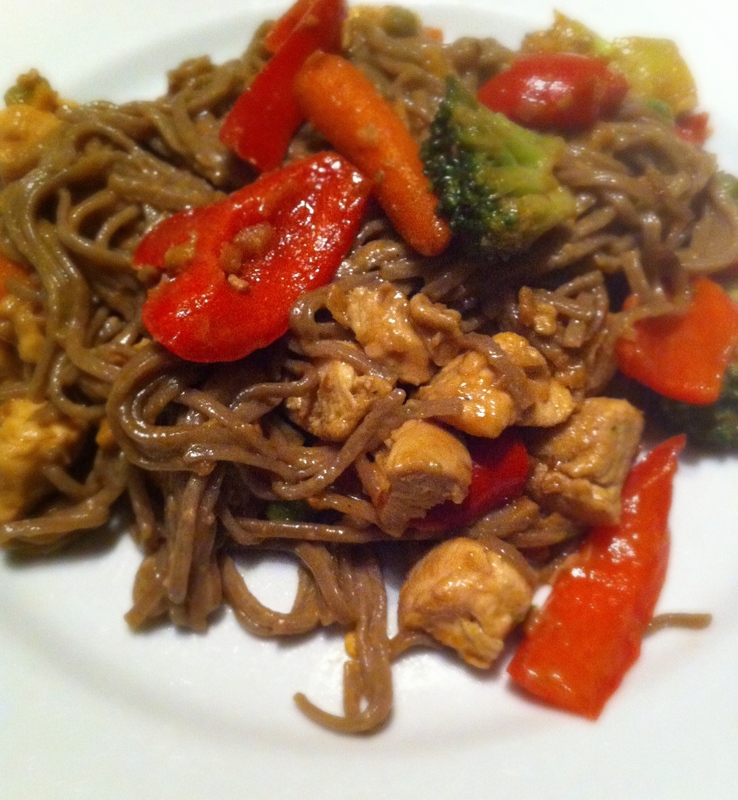 If you enjoy a spicy stir fry with a taste of peanut and buckwheat noodles, this dish will do it for you. I also find this meal to be one of those warm and comforting dishes that you want to eat on a cold cloudy day curled up with a blanket. Sort of like my Spicy, Warm and Comfy Pasta. In a large wok heat up the vegetable oil on medium high heat. Toss in the chicken, half of the ginger and garlic, half of the soy sauce and the chili pepper flakes, cook until browned. Remove the chicken and now toss in all the veggies and the remaining garlic and ginger. At this time I threw the noodles in boiling water and cooked for 4 minutes. Once the noodles are cooked, remove the veggies from the wok and replace with noodles, sesame oil and peanut butter, mixing through until the peanut butter is melted. Throw in the chicken and veggies to heat through and serve. I love this! Sounds wonderful! I love sesame oil It adds a lovely flavour to so many dishes, and along with the peanut butter it must make the whole dish delicious and nutty. I add sesame oil to most of my Asian recipes, love it! Super! Let me know how it goes, love to hear how it turns out.